AAA State of Play has reduced the price of Toddler Recycled Plastic Picnic Table, one of its best-sellers by $35. The product is now being sold at $245 on the company’s website. Recycled plastic picnic table for toddlers is always in-demand and we decided to make the purchase experience more delightful for buyers by offering a discount of $35. It is being loved by our customers. The renowned online store for playground equipment is again in the news for announcing a discount of $35 on its best-selling product, Toddler Recycled Picnic Table. Buyers can now purchase the table for $245, which was earlier priced at $280. Speaking about the latest discount deal on the picnic table, a senior executive from AAA State of Play stated, "Recycled plastic picnic table for toddlers is always in-demand and we decided to make the purchase experience more delightful for buyers by offering a discount of $35. It is being loved by our customers.” Resin wood slats are used for making the table top and seats of the picnic table and are supported by a black recycled plastic base. The new recycled plastic picnic table for toddlers is offered in a variety of colors by AAA State of Play and is designed to be durable as well as easy to clean. White, red, blue, black, green, grey and cedar are some of the colors that the recycled plastic toddler picnic tables are available in. 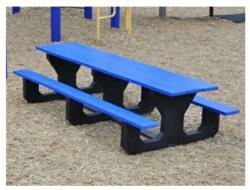 Customized colors are also provided to customers on order of recycled plastic picnic table for toddlers in bulk. Being six feet in length, this plastic playground equipment can seat numerous toddlers and are well suited for daycare centers as well as preschools which are visited by a large number of toddlers. Convenient delivery services are provided along with support on installation for the recycled plastic picnic table for toddlers from AAA State of Play. You will find wide range of playground slides and playground accessories on the website. Amazing and well-designed range of outdoor furniture as well as accessories are provided by AAA State of Play at affordable prices. Excellent quality materials are used in manufacturing playground equipment in order to ensure that they can withstand the external environment. Playground safety surface like rubber mulch are also provided by AAA State of Play and offer a safe and injury free surface for children to play on. All equipment available can be easily browsed online and all furniture and accessories are updated on a regular basis to provide the latest designs of items for children.